Just a typical day for me. Out of bed at the crack of dawn, make bed, meditate, make green juice, and read the paper while I eat my granola. That's when the real day begins. into these and then sort them into those that will go to my booth and those that will go on Etsy. 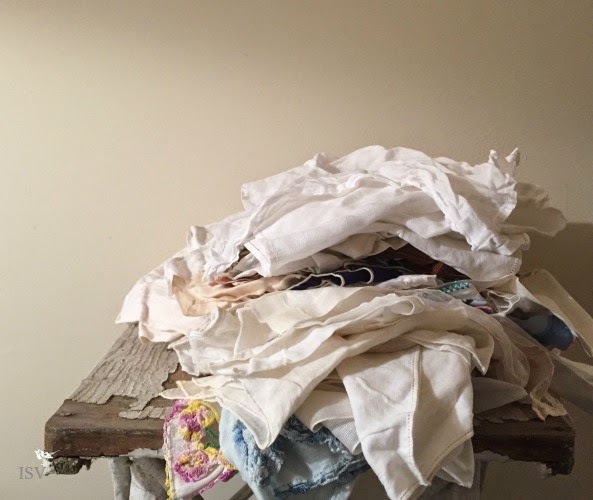 Once that is done I load my car with my weeks worth of finds for the booth and head out, stopping on the way to pick up a check at the consignment shop where I sold a set of dishes last month. I had an extra plate, so I saved it for myself. I love blue transferware. I couldn't even bring myself to show you a photo of my booth. It looked like a hurricane had blown through it. So the first thing I had to do before I could add any of the new stock was clean up the mess. I'm not sure how anyone was even able to walk into it. It's a good thing I went today. I did take a little time the other night while I was watching TV to start a little sewing. 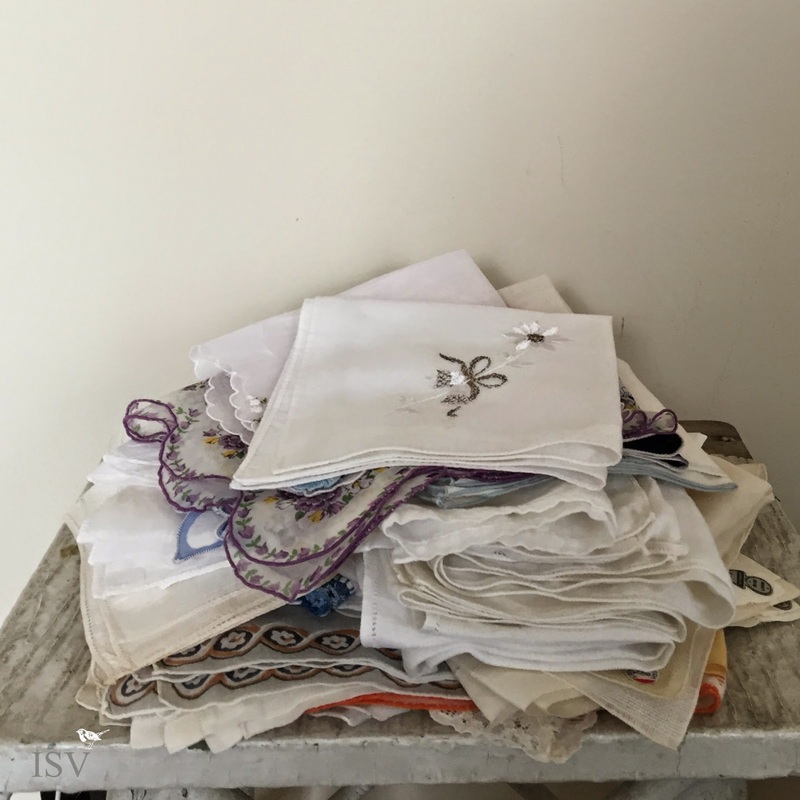 You may remember that I had started to sort through some of my old cutter quilts and fabrics. I haven't had the energy to set my sewing machine up yet to get started on some pillows, but I did hand sew some sweet hanging hearts, which I took to the booth this morning. On the way home I found gas for $2.77 a gallon. How exciting is that. I figured I better stop and fill up because with these early cold temperatures I am afraid that the prices will start to shoot up again. They seem to use any excuse they can find to raise them. You know like, "oh it's your Aunt Bertha's 100th Birthday? Well, we better raise those prices. Wouldn't want you driving on over there on cheap gas". That's my day so far. Getting ready to heat up some leftovers from the dinner I cooked last night. Salmon, baked potato, and acorn squash. YUM!!! Then it's time to get started on the rest of the day. Wow, is it really only 2:30. I was thinking it must be almost time to get back into my jammies. SIGH!!! So how is your Saturday going? a good, productive day for you thus far! cute hearts. I love the turkey plate, too. 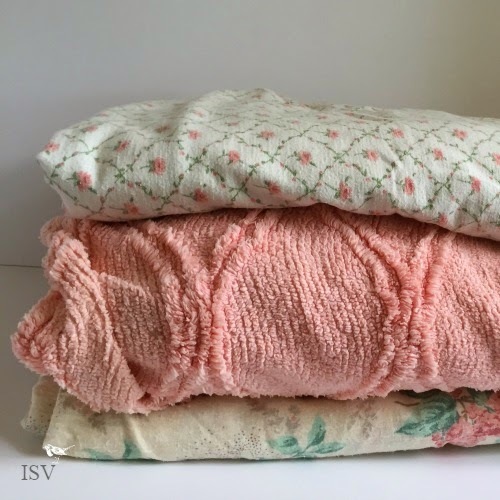 Would love to be sewing some cute things out of the old chenille...it's such a pretty color! Enjoy your afternoon! Hugs! Those are some cute hearts. Enjoy your weekend. I like that blue and white transferware plate! Perfect for Thanksgiving. Isn't it great that gas is now cheaper? We get ours at Costco or Walmart most of the time. Dread when the prices start to go back up. You know they will! 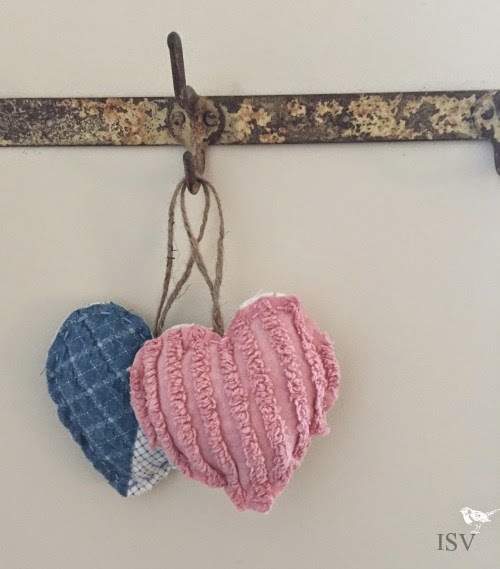 The chenille hearts are darling. How creative. I love hearing "A Day in the Life". 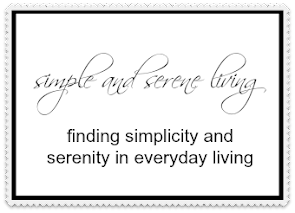 Your first paragraph made me sigh...that's the person I strive to be...up early, moving, doing healthy things. Another sigh. I have such a love for vintage napkins, I'm off to have a peek. You get more done before I get up than I do all day. Love that blue and white plate! Enjoy the rest of your day, sweet Laura. 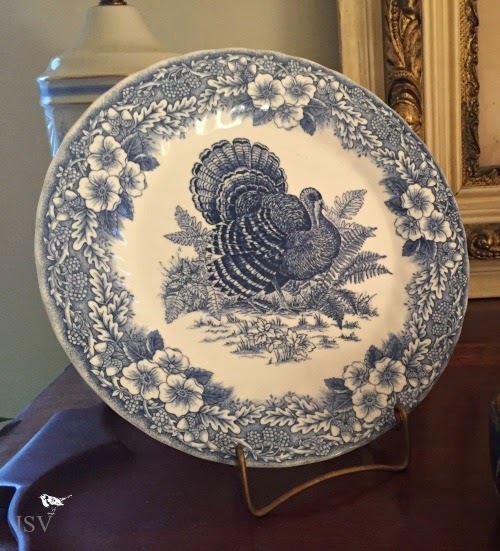 The blue and white turkey plate is awesome! Yay on the gas prices.... I don't understand WHY they are down, and will still be puzzled when they creep back up again. No rhyme or reason. Sounds like you had a productive day!